Licensed Deacon Thomas Lewis Benzler (Ioway), age 80, was called to his eternal rest on Oct. 3, 2018, after a long battle with cancer. He died peacefully at his home in Port Angeles, Washington, surrounded by family. Tom was born July 28, 1938, in Fresno, California to Edward and Kathleen (Tribble) Benzler. Tom graduated from high school in 1956 and went on to serve with the US Army Reserves from April 1957 to November 1962. He then worked for Fresno Irrigation District as an equipment operator until retiring at age 62. Tom married the love of his life, Cathy, on June 1, 1974. They moved to Port Angeles, Washington in 2003. He became a Licensed Deacon in 2012 and served under the direction of Lutheran Indian Ministries. Tom loved the Native American Indians and spent most of his time serving on various reservations on the Olympic Peninsula, especially the Lower Elwha Reservation. Tom and Cathy were blessed with three children: Miles, Brian and Tammy; and eight grandchildren: Jeremy, Caitlin, Jett, Jonas, Zack, Sylvanna, Desirae, and Joshua. Tom's two brothers, Robert and Frankie, and sister Virginia Amicarelli, all preceded him in death. Tom Benzler's internment will be at Sequim View Cemetery on Wednesday, Oct. 10 at 11 a.m., with a memorial service to follow at noon at Faith Lutheran Church, 382 W Cedar St., Sequim, WA 98382. One of the great blessings of the work God has called me to as Executive Director of Lutheran Indian Ministries is the incredible people with whom I have the opportunity to work. Through our regular correspondence with you, our partners and friends, we have shared their stories and the important work they do. The men and women on our staff are not just my employees; they are my friends. And based on the notes and we receive from many of you, you feel the same way. By the grace of God and with your encouragement and friendship, they are able to continue in the unique mission field of Native American ministry. Like you, I am constantly amazed by their unshakable faith, remarkable dedication, and overwhelming passion in their call to minister among the broken. Many of our staff have overcome brokenness themselves and now work in the hidden outposts and obscure recesses of our country where churches do not exist, but where the truth of the Gospel needs to be told and the healing from historic pain, suffering, and trauma needs to be facilitated. No one on our staff has done this better than Deacon Tom (Ioway) and Deaconess Cathy (Cherokee) Benzler. Their work with Native People on the Olympic Peninsula of Washington State has been nothing short of remarkable. The Benzlers, a formidable ministry team if ever there was one, have done ministry that meets the physical needs of Native people, but never neglected the heart. Cathy once told me, it was not their job to “fix” the Native people they work with, but to help and walk alongside them all the while leading them to the cross, proclaiming the Gospel, healing wounds, and making disciples. What a blessing! On December 31, 2017, Tom retired from formal active ministry, and on June 30th, Cathy joined him. Tom and Cathy persevered in their ministry to the Native tribes of the Pacific Northwest despite numerous challenges, including serious health concerns that would have stopped most people long ago. But they were inspired by their call to serve the Lord and stirred by your prayers and encouragement of the ministry happening through Hope House. Their retirement may have you wondering what will happen to this vital and important outreach without them? It was Alexander Pope, in his classic poem, “Essay of Man,” who first coined the phrase: “hope springs eternal.” As Christians, our eternal hope is in the life, death, and resurrection of our Lord and Savior, Jesus Christ. And as LIM answers His call to minister to our Native brothers and sisters on the Olympic Peninsula, we have made provision for the Hope House Ministry to continue (not eternally) for as long as friends like you continue to support it. We are excited to share with you that the Hope House Ministry will become a part of Makah Lutheran Church, in Neah Bay, Washington, and continue its outreach of hope under the leadership of Ben Maxson and his wife, Natalie. Tom shared with me that over the years, they have had amazing opportunities to be the hands and feet of Jesus on the reservations and to assist the Native people in their area to start a number of small projects that led to bigger, tribe-sustained projects. With your help, Tom and Cathy plowed up thorny fields to create community vegetable gardens, gathered volunteers to fill potholes around elders’ homes, helped to build the Native culture by planning drumming circles and dance groups, collected backpacks and school supplies for the Native children, and impacted lives for eternity through Bible Study and Christian fellowship. These projects happened by the grace of God, through Tom and Cathy, and were made possible because of your passion for your Native brothers and sisters. Your commitment to the mission of Lutheran Indian Ministries reaches far beyond small projects and physical needs. It reaches into the hearts and souls of Native people and impacts lives every day! We are so grateful to you for your support of their work and the ministry of LIM. For more than a decade, generous donors like you have supported Tom and Cathy and the work of the Hope House. Will you prayerfully consider a gift today, in thankfulness for Tom and Cathy’s service, to springboard the Hope House in its new location at Makah Lutheran Church? We give thanks to God for passionate and faithful servants like Tom and Cathy Benzler. We pray special blessings on them for their dedication to God’s ministry and to Native people. We ask that you hold Tom and Cathy deeply in your hearts and keep them constantly in your prayers. Well done, good and faithful servants, Tom and Cathy Benzler. May God bless and keep you, always. Because of you, Lutheran Indian Ministries reaches places where traditional churches don’t go. Because of your past support, Lutheran Indian Ministries is able to share the Gospel with some of the world’s most forgotten peoples. Your gifts to this ministry change lives and save souls. We give thanks and praise to God for Tom and Cathy Benzler! For more than a decade, Deacon Tom (Ioway) and Deaconess Cathy (Cherokee) Benzler have served the Lord on the Olympic Peninsula in Washington State. Based in Port Angeles, Tom and Cathy work primarily with the Klallam People of The Lower Elwah Reservation but over the years have expanded to serve a number of other tribes in the Pacific Northwest. In addition to proclaiming the Gospel of Jesus Christ through home Bible study and prayer groups, Tom and Cathy have ministered to the physical needs of their “flock” through Hope House which provides food, clothing, and a variety of supplies for those in need (through donations from generous donors like you). "It is amazing how God has provided over the years," Cathy explains. "We'll receive clothes or supplies that we don't think we need and then shortly after we'll have someone ask for that exact item. God knows best!" Tom and Cathy work tirelessly for the Native peoples on the Peninsula and have used their ministry training skills and talents to reach out to individuals in communities who have been victims of abuse, helping them to strip off the shame they feel in order to see themselves as the child of God the Creator made them to be. But all good things must come to an end. At Lutheran Indian Ministries' most recent staff retreat, Tom and Cathy announced their plans to retire. Tom officially retired in December 2017, and Cathy will join him in retirement at the end of June 2018. The Olympic Peninsula has been richly blessed by Tom and Cathy, as have each of us. Their love of the Lord and their passion for Native peoples is on display in every moment of their lives. We will miss them tremendously. But, this is not the end of Hope House! 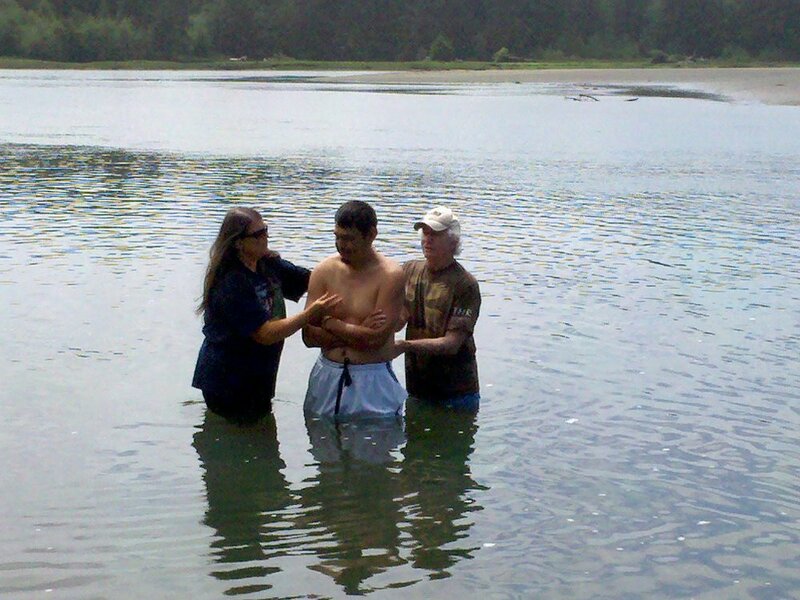 Tom and Cathy have been working with Ben and Natalie Maxson in Neah Bay to transition the ministry to become a part of the Makah Lutheran Church activities. We give thanks and praise to God for Tom and Cathy Benzler. We feel honored and blessed to have been able to work alongside such faithful and dedicated servants! May the Lord bless you and keep you always as you enjoy your retirement years together. Enjoy your next adventure! "Some people are like lakes. They change very little as they age. Some people are like rivers. When you trace the Mississippi, or any other river at its source, it can be very small. Later on, it can be wide and strong. When it meets the ocean, it spreads out." In other words, names should change as the individual changes. wipe the sweat off your brow, step into that nice, air-conditioned store, and help provide love to the Native people of the Olympic Peninsula in the shape of a glove. Your commitment to Lutheran Indian Ministries reaches far beyond the stories you see on our website or in these newsletters. It is amazing the way God can work in a person's life. We never know what a small, simple act of love can do to make a huge difference. If you gave a gift or prayed for Lutheran Indian Ministries last year, you made this possible, and we want to you know how much we appreciate you. We are so grateful for your generosity and passion. For most of us, the back to school season involves trips to the local stores to pick up new pencils, folders, and notebook. Perhaps there's a special back to school outfit and, of course, a new pair of shoes. But for the kids who live on the Lower Elwha Reservation and surrounding communities, access to new shoes (and money to purchase them) is limited. But this year's students will be sporting new shoes, thanks to the Hope House. Amid machines with flashing lights and rhythmic beeping, Deacon Tom (Ioway) and Deaconess Cathy (Cherokee) Benzler sit hand in hand with a Native elder of one of the many Olympic Peninsula tribes with whom they serve. Though nurses come in and out, checking numbers and fixing tubes, the atmosphere of the room is peaceful. This man, a close friend of the Benzlers and a regular at their home Bible Study, is secure in his salvation and determined to face his final days with courage and faith, which he hopes will draw his family members and community nearer to Christ - family and friends who come in large groups to be with him, hear his stories, and soak up his wisdom. He wants us to get out of our nests, out of our comfort zones to spread our wings. Sometimes, we’re afraid to do so, because we fear failing or not getting it just right. It all comes down to trust. As the baby eaglet trusted its parents to keep him from hitting the ground, how much more should we trust in our Heavenly Father who loves us so much and is always there to scoop us up in His hands when we stumble or fall? Our Creator wants us to trust him. His word teaches us to trust him, and His word never returns void. Even Jesus, who knew His Father completely, felt abandoned and hurt. As he hung dying for the sins of the world, he cried out to His Father asking why he had been forsaken. But today, the child, struggling to find their identity, can experience love from Jesus by picking up a child’s book and reading the Easter Story. Without Jesus in our lives, we wouldn’t experience hope—hope that does not disappoint. Jesus Christ redeemed us from sin and death through His sacrifice for us, and because of His love we now have the hope that so many Native people long for. All they need is the trusting heart of a child. How many times is our faith put to the test? Whether it’s because we lack trust or are fearful and lose hope as we look for the worst in every situation, our lack of faith can cripple us until we are unable to move forward. We can even get to the point that we may think “even God wouldn’t (or couldn’t) help us." Jesus came into this world to bring hope, healing, and to set the captives free. He is the Word, and His Word is life sustaining forever and ever. Almost immediately, the tears of sadness were replaced with tears of happiness. People started realizing that this time of year was about each and every one of them as individuals, that God loves them, and that He is with them. As people refocused on Jesus and took their eyes off of all the things that man has created for this time of year, they finally began to see why we celebrate the birth of God’s Son, Jesus.